Firefighters in California are continuing to battle some of the most destructive wildfires ever to hit the state. The raging Mendocino Complex fire, comprising twin blazes in the state’s north, has become California’s largest wildfire since records began a century ago. About 100 miles northeast, near Redding, crews are also fighting the Carr Fire, which has destroyed hundreds of homes. 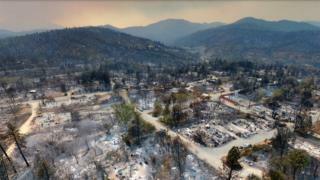 Here, drone images released by the City of Redding reveal the scale of the devastation in the area. The Carr fire swept through the rural communities of Keswick and Shasta as well as hitting homes on the outskirts of the City of Redding. 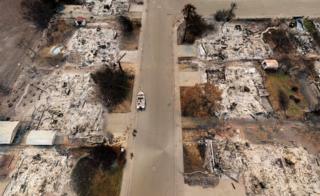 The blaze killed at least seven people and destroyed at least 1,077 homes. 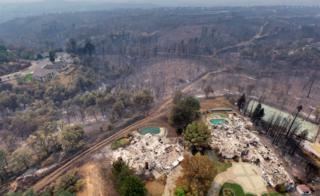 Burning through almost 177,450 acres, it was 48% contained by late Thursday. 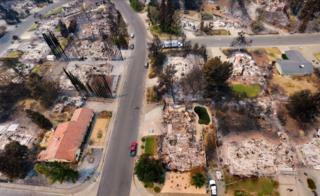 Whole rows of houses were reduced to rubble, with only a few individual properties left standing. Thousands of firefighters have been struggling to contain the fires, with help from international teams, US army personnel and more than 1,000 prisoners – low-risk offenders who volunteered. Wildfires are a common occurrence in California during the state’s long, hot, dry summers but experts say this has been the worst start to the season in 10 years. The California Department of Forestry and Fire Protection says strong winds, low relative humidity, and warm temperatures can contribute to extreme fire behaviour. More than 23,000 people have had to be evacuated – many not knowing what they will find when they finally return home. 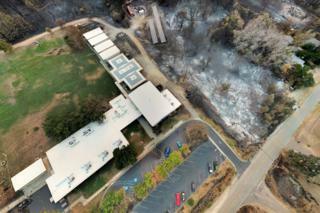 Aerial photos were collected as part of a multi-agency collaboration. 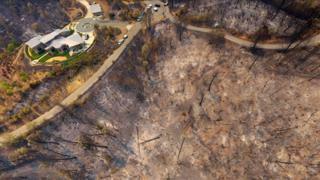 Licensed UAV pilots from Menlo Park Fire District, Alameda County Sheriff, Contra Costa Sheriff, and other agencies assisted the City of Redding in capturing the aerial photos. 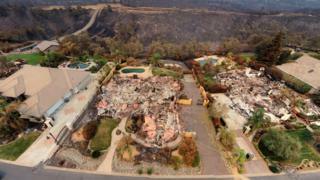 The City said it would also like to acknowledge CAL FIRE for permitting the use of UAV technology to assist in damage assessment.